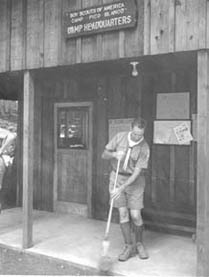 Fran sweeping the porch of the administration building at Camp Pico Blanco during summer camp, 1968. Fran Petersen met Béla Bánáthy while both were serving Scouting. 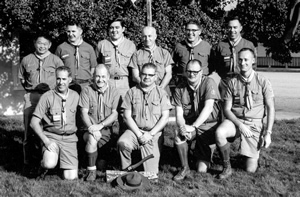 Fran was a Scoutmaster and learned of Béla's interest in youth leadership development. Fran and Béla, along with Joe St. Clair, Maury Tripp, Paul Sujan, and later Paul Hood established the White Stag Program. Fran remained involved off and on for many years. Fran was known to watch youth staff from the shady side of a redwood tree, observing quietly. During the summer of 1968, he as Program Director seemed to be everywhere, moving like a deer through the woods. Fran that he did not like to walk, but would run, the trails. That is how he taught his sons to explore the woods. Fran was both private and generous. In 1974, it rained during nearly every day of summer camp, May staff were unprepared for the rain. Fran unselfishlessly lent his raincoat so one staff member could hike out to Mt. Manual trail to check on the condition of one of the Troop Leadership Development crews. He never said a word when the rain coat was ripped to shreds over the next few days after the staff member was forced to bushwhack through the trails of Pico Blanco and Mt. Manual. Fran's mother had been raised by an uncle, as she was illegitimate, but her father and the family wanted to see that she was nonetheless provided for. The uncle received money to raise her every month, and he saved the entire sum for her. She learned of the account upon reaching maturity, but she saved it. Finally, she went into A. P. Gianni's Bank of America and cashed out the entire account -- two days before the Crash of '29. She had a tidy sum and determined that she would build herself a house, which she proceeded to do, in a tiny town far down the Salinas Valley, a little town named Chular. This is where her husband made a living as a mechanic. In 1930 the house she had built had inlaid wood floors, plaster ceilings, and other amenities usually only afforded by the wealthy. This is the house that Fran grew up in. Fran took great pleasure in remembering people's birthdays and other special dates. Many friends were flattered, surprised and delighted when Fran would remember their birthday with a personal note. Experimental Wood Badge course #25-2. Held at Ft. Ord during January and February, 1968, it was staffed by (front, L-R) Fran Petersen, Maury Tripp, Joe St.Clair, George Toole, and Bob Bowman; (rear, L-R) Frank Masamori, John Larson, Louis Lang, John Martin, Chet Frisbie (Asst. Council Scout Executive). Every Scoutmaster then brought his troop to White Stag camp the following summer. He was usually pretty private, preferring not to give out his phone number to most people, and even guarding his address. Yet when asked to do something, he rarely said no, even if it was not convenient. He loved to walk and hike and would regularly, up until the last months of his life, explore the trails of Big Sur and the Ventana Wilderness. George St. Clair, Joe's son and one of the original Senior Patrol Leaders, told me that he and a few friends would regularly invite Fran on hikes, and he rarely said no, even in the last few months as he grew weaker. 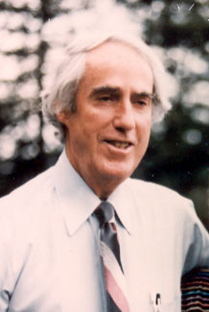 Fran was an inspiration to many in the example he set in serving others selflessly, in his curiosity, his visionary thoughts, his intellect, his willingness to go contrary to conventional wisdom and challenge the status quo. As long as someone is alive in anyone's memory, he has not passed from this earth. In Fran's case, he shall live for a great many years more in the spirit of all those who follow the White Stag.